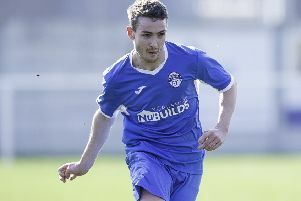 A second successive clean sheet was encouraging for Frickley Athletic, but their failure to get a goal at the other end left a frustrated feeling as they missed a chance to climb into the top half of the Evo-Stik League’s East Division. The goalless draw at Stamford did extend the Blues’ unbeaten run to seven matches and lifted them up a place in the table to 12th, but they would have been in ninth had they brought back all the points from their travel to Lincolnshire for the second week running. They so nearly repeated the feat of the previous week at Spalding United when they had won 1-0 courtesy of an injury-time winner from a defender. This time the Frickley contingent were left disappointed as Greg Young’s header from a corner appeared to possibly go over the line before being cleared, but the officials ruled no goal. Frickley started with the same 11 that played against Spalding and were looking to quickly double up, having beaten Stamford 4-1 at Westfield Lane just two weeks previously. Their hosts defended better this time, aware of the threat offered by Jacob Hazel, Ant Wilson and company. Chances were at a premium throughout the game and it was hard work for both sides. Todd Jordan did set up Hazel, but his shot was blocked out for a corner and Tyler Walton released Wilson only for his shot to be saved and the follow-up from Hazel to go over. Into the second half the pattern remained the same, although Frickley were indebted to goalkeeper Hugo Warhurst, who made a fine save after a rare dangerous Stamford attack. A home player could count himself fortunate to only receive a yellow card after leaving Blues defender Jameel Ible on the floor in the goalmouth, but there were few talking points about attacking football as the teams and the wind cancelled each other out. That was until the controversial decision in the last minute when Ben Algar’s corner was headed down by Young. All the Frickley players were adamant that the ball had crossed the line, but the officials did not agree and the hosts escaped with a draw. Man of the match was a close run thing between hard working forward Wilson and wing-back Algar who tried his best to instigate attacks while the back line once again looked strong as did the midfield trio of Jamie McGuire, Walton and Jordan. The result meant that manager Martin McIntosh has still only tasted defeat once at Frickley in 12 games. He has certainly succeeded in tightening the team up after they were leaking goals, but will now be looking for more of a cutting edge again in attack. Frickley are back at home this Saturday when they will try again to close the gap on the teams in the play-off positions. They take on Lincoln United who are just behind them on goal difference. With both teams only two points behind Loughborough Dynamo in seventh there is plenty at stake if they can win.